Tim Larkin, U.S. self-defense expert, banned from entering United Kingdom. Tim Larkin tried to board a plane from his home in Las Vegas on Tuesday, but was given a UK Border Agency letter saying “his presence here was not conducive to the public good”. Mr Larkin, who was due to host seminars, told the BBC the move was a “gross over-reaction”. Mr Larkin – who trained as a US Navy Seal – runs a company teaching combat to military and law enforcement clients in the United States. 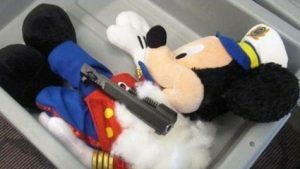 TSA officials say .40 cal pistol, bullets and other gun parts were artfully packed inside Mickey Mouse stuffed animal at Rhode Island airport (video).